What does it mean to live and work inside the information and communication technology revolution? Drawing upon cognitive, economic, management, political, and sociological theories, this book focuses on the nature and significance of newly-emerging patterns of social and technical interaction as digital technologies become more pervasive in the knowledge economy. What does it mean to live and work inside the information and communication technology revolution? The nature and significance of newly emerging patterns of social and technical interaction as digital technologies become more pervasive in the knowledge economy are the focus of this book. The places and spaces where digital technologies are in use are examined to show why such use may or may not be associated with improvements in society. 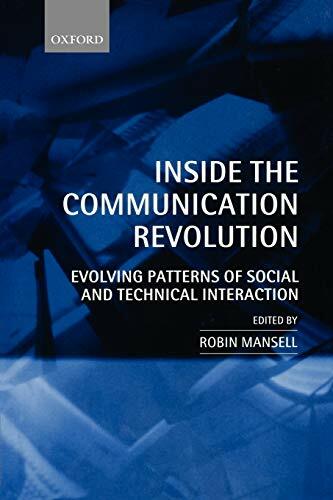 Studies of on- and off-line interactions between individuals and of collective attempts to govern and manage the new technologies show that the communication revolution is essentially about people, social organization, adaptation, and control, not just technologies. This book contains original empirical studies conducted within a programme of research in the Information, Networks & Knowledge (INK) research centre at SPRU, University of Sussex. The authors draw upon cognitive, economic, management, political, and sociological theories to provide insights into the acceptance of and resistance to interactions made possible by the Internet; information and communication systems in the newspaper, insurance, and banking industries; electronic commerce services; and other applications such as geographic information systems.